Short Term Courses after 12th Commerce to Get a Job Easily. 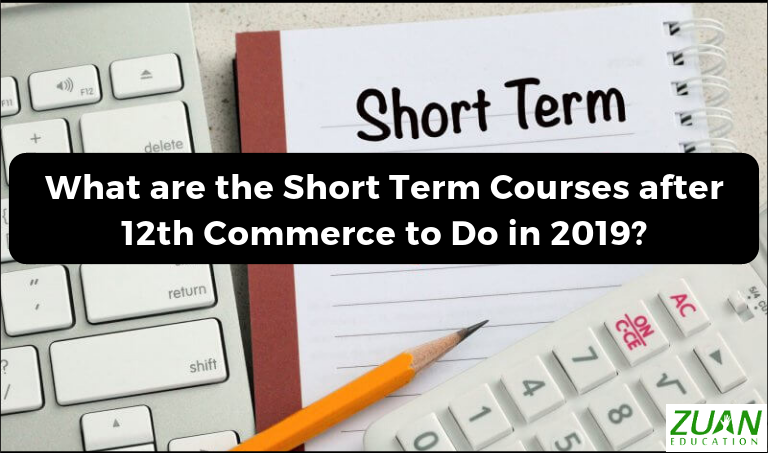 What are the Short Term Courses after 12th Commerce to Do in 2019? So you completed 12th. And are confident of passing 12th from Commerce. You may be having your own plans after class 12. Undoubtedly, there will be some interim free time before you join a college degree course. Therefore, why not use that time, registering for any one of the short term courses after 12th commerce? It could be frustrating. I understand. But you can spare just 2 hours in a day to do these job oriented short courses. Being a commerce student, learning these commerce-related certificate courses will be adding a feather in your cap. Before going into the list of courses, why should you do small courses after 12th commerce. Let us place the scenario. Maybe, you have a great interest in one particular part of the commerce stream. Say, for example, doing online marketing. And you want to hone your skills in digital marketing. Or maybe one discipline of career fetches you more salary. And you want to master it. Understandably, 12th or any other management courses will not teach a specialization course in that field of your particular interest. In view of this scenario, you may be searching for indian institutions that offer such short term courses. And consequently the list such short term courses after 12th commerce. Therefore, let us do a small research on a few courses. That will easily fetch you a job after you become either a graduate in commerce or post graduate in commerce. To do marketing through social media such as Facebook, Twitter, Instagram etc. Marketing your website contents like blogs etc. Therefore it is an important course for commerce students like you. Therefore, you have to get specially trained for this. You cannot simply host or post content online and wait until people find your content and take actions. Significantly, you need the help of SEO in this. Therefore it is compulsory for you to learn SEO after 12th commerce. This will help you survive in the online market competition. Next to the posting of your letters in that Red Post Boxes came the SMS. Concurrently, you also had the Courier Service to send your parcels. Telegram was a great visitor to all of the houses in the past. Then came the email. It all started of in India with Yahoo mail, Hotmail, Rediffmail etc. People started sending personal and business messages through email. Create valuable email content that will be relevant to each customer etc. Your salaries range from Rs. 2 lakhs per annum and rise growing to Rs. 8 – 12 lakhs as you get promotion. Furthermore, many big companies hire PPC experts with a high paying job in MNCs & corporates. Significantly, you can get personal attention from the trainer. You will be given live projects to work on. Moreover, you are free to ask as many questions as a fresher. You will get a marketing related certificate in a very short time. So you can apply for a job soon. Particularly, the fees will be very affordable. You can even pay in EMI. Furthermore, class timings can be adjusted based on your comfortable timings. You will be put only in a small batch of not more than 4 students. So you will get more individual attention. Markedly, you will be provided with laptops to work on. You can attend classes even during weekends. You can be of any age to attend the class. Significantly, your trainer will be a professional digital marketer working in a company. You will get a course completion certificate. This certificate will be an industry-oriented job certificate. There are also other one year diploma courses, courses in interior designing, fashion designing and computer courses you can do after 12th standard. But doing any one of the above courses gives you job guarantee and helps you take flight in the commerce industry that has got more of online presence.